Sister Macdonell, often incorrectly spelled as MacDonald, was one of the early suburbs in the former Cornwall Township that became a Cornwall neighbourhood on January 1, 1957 when the City annexed much of the Township. The name Sister Macdonell no longer appears on Cornwall maps. The Macdonell family farm property had been passed down to Sister Janet Macdonell and ultimately to her religious community, the Religious Hospitallers of St. Joseph. The property was a strip of land on the east side of McConnell Avenue, north of 3rd Street East, part of Lot 6, just east of the original Square Mile Town. 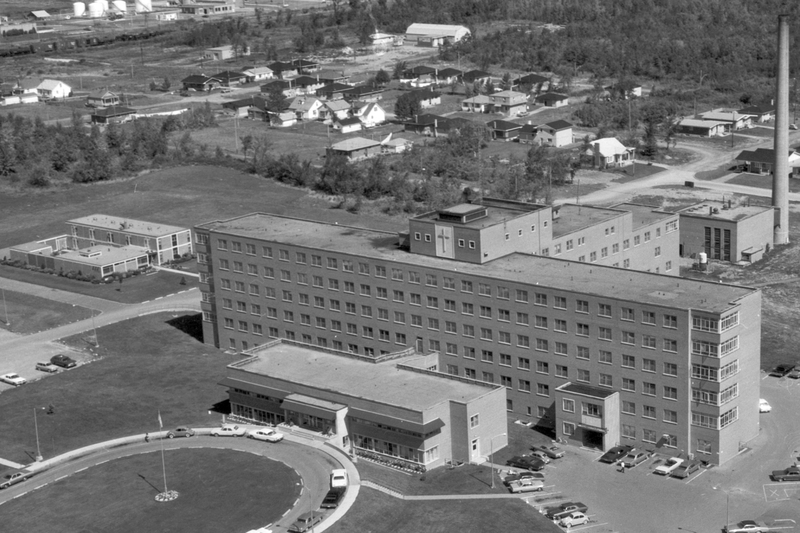 In 1948, Sister Marie de la Ferre made a provincial application to replace the outgrown Water Street Hotel Dieu Hospital. In 1952, sod was turned on the Sister Macdonell site and construction of the new five storey, 250 bed Hotel Dieu Hospital began in late 1952. The cornerstone was laid on June 16, 1954. June 1, 1955 was the planned opening date, but Maternity & Pediatrics were not ready in time. The first patient was admitted on August 17, 1955 and on September 14, 1955, the hospital officially opened to a crowd of more than 3,000. The new hospital was fully approved by the Joint Commission on Hospital Accreditation in 1956. The project included a separate boiler house and laundry. Not only did the Sisters donate $200,000 and the land, but they also assumed responsibility for the $1,800,000 loan and contributed an enormous amount of free labour. Their contribution to the community was considerable. The above photo was taken in 1959. The photo above is from 1970; it reveals a new structure to the north of the hospital. Constructed in 1961 on the hospital site at 840 McConnell Avenue and opened in November the following year, the new R.H.S.J. Hotel Dieu Convent housed the Sisters who were responsible for the Hospital Administration. Prior to that time, they lived in quarters in two areas of the hospital. Living on-site meant that the Sisters could be called into action on very short notice day or night. The order had also been responsible for the original hospital. With its 25 bedrooms, in 1989 the Convent was able also accommodate the 12 Sisters from the Macdonell Memorial Convent. Ca. 2000, the religious community relocated to a large brick house at 783 Guy Street, to the rear of the hospital, on separate property. 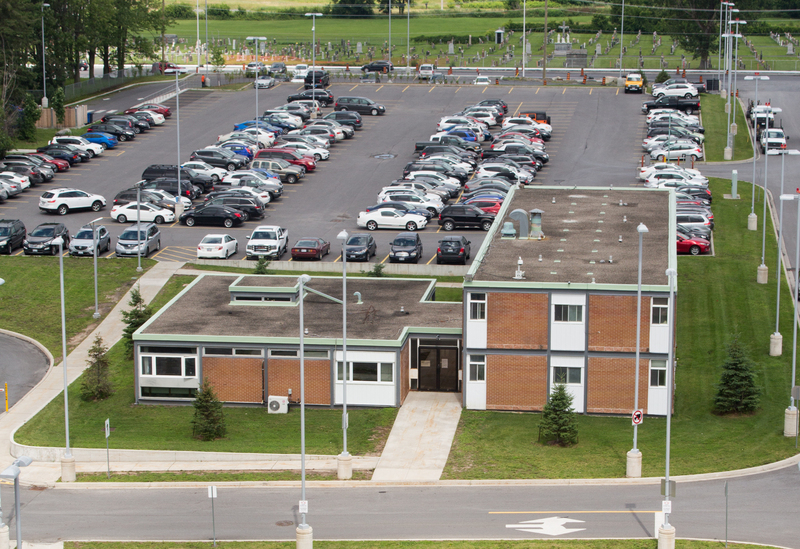 In 2003 the Sisters gave over the hospital and property for a token $1, pending a consolidation of services from the General and Hotel Dieu sites. Over a period of some years, the former “new” Hotel Dieu Hospital and the former Cornwall General Hospital would progressively amalgamate under the name of the Cornwall Community Hospital, largely being rebuilt on former Hotel Dieu Hospital expansive property, much larger than the half-block Cornwall General site that would be re-born as The Care Centre. On Friday, July 21, 2017 the Cornwall Community Hospital announced that a contract had been awarded for the demolition of its North Annex. The hospital’s I.T. and Facilities Departments were due to have completely vacated the premises by the end of the day in favour of more modern quarters in the expanded hospital complex. Once the former R.H.S.J. convent turned Annex has been taken down, the area will be used as a doctors’ parking lot. The former convent has witnessed a variety of uses and structural changes over time. Gone are the former garage and courtyard walls. 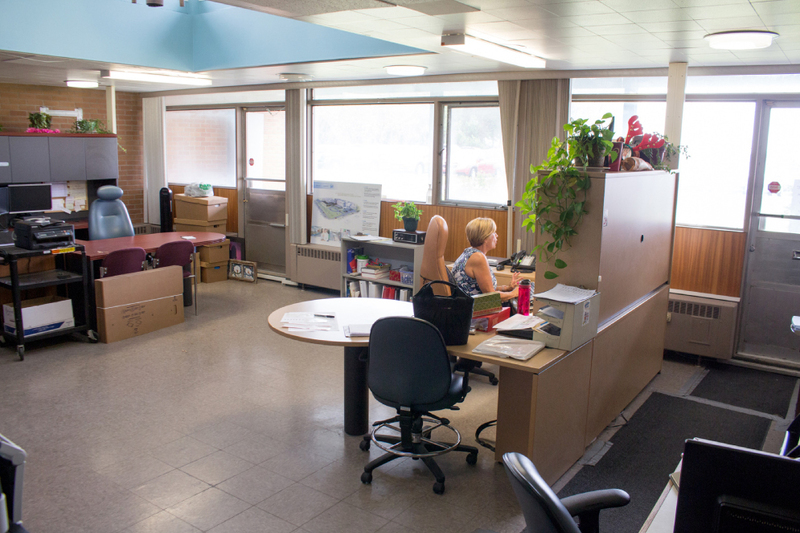 The Sisters’ airy community room became hospital office space with a view. 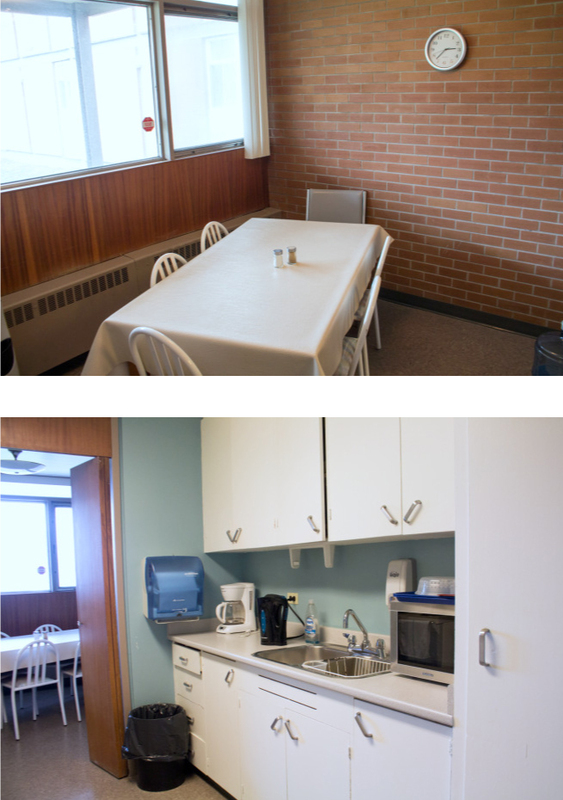 There is an adjacent kitchenette and break room. Some of the symbols associated with the R.H.S.J. Convent are still witnessing to the buildings’ original purpose. The two-storey bedroom wing was separate from the community wing. 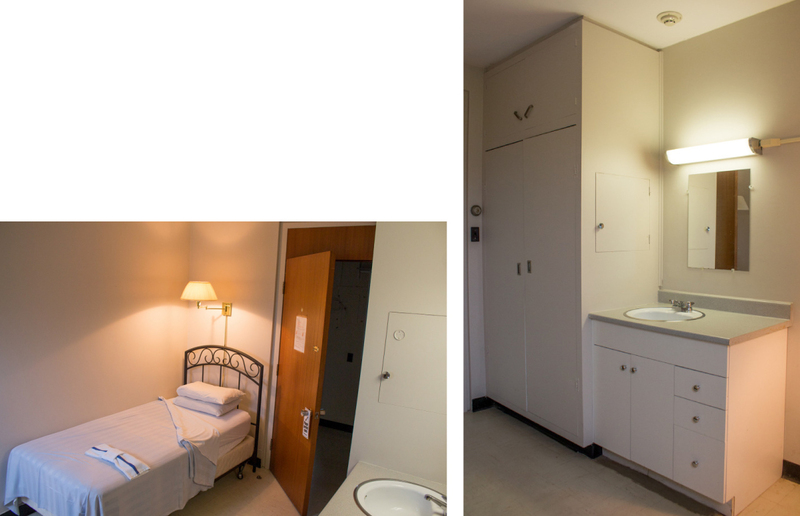 Some of the former convent bedrooms served those in training at the hospital. For a time, long-time Hospital Chaplain Father Claude Halle also lived there. A wall had been removed to facilitate a combined kitchenette and lounge. In many ways this moment further delineates the end of an era of Catholic public acute care hospitals in the City. To the immediate south of the hospital stands the McConnell Medical Centre as depicted in 1970. In this 2017 image we see that the Medical Centre has been enlarged considerably and further south are two other significant structures on the former Sister Macdonell estate. On April 4, 1967, sod was turned for the $3.1 million Cornwall Regional School of Nursing, located on the s.e. corner of 4th St E and McConnell Avenue. Completed in June of 1968, the nine-storey School housed 144 in the residence and had classroom space for 200 students. It was the replacement for both the former 1929 St. Joseph’s School of Nursing on York Street as well as for the Cornwall General Hospital School of Nursing on 2nd St. E.
Nurses in training were given practical experience at City hospitals as well as in Winchester and Alexandria. 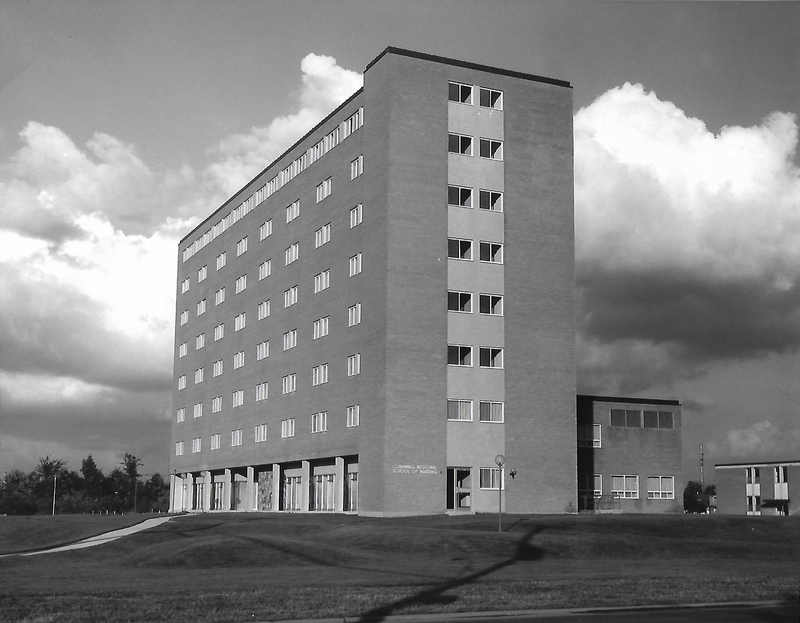 In 1973 this building became the student residence for St. Lawrence College, and was renamed Mille Roches Hall. 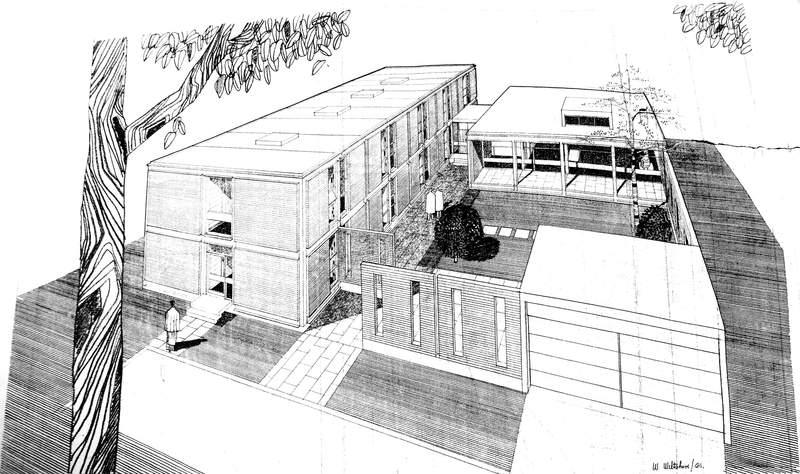 In May of 1989, the College announced that it planned to have a new student residence erected on the riverfront and opened by September of the following year; the new facility was to augment, not to replace the 4th St E residence. Having become redundant, the 4th St. E. building was put up for sale for $1.5 million in 1996. It underwent considerable modifications to become the McConnell Manor seniors’ residence, opening in May of 2000. In 2007 the owners constructed a second building to the east of the original 801 4th St. E. structure at a cost of $18.5 million for 118 apartments. Pictured is the south side of the complex in 2017.